Sir Robert Napier (died 1615), was an English-born judge in Ireland, who was notorious for incompetence. He was also a long serving member of Parliament. Napier was born at Swyre in Dorset, a younger son of James Napier, a member of an old Scottish family, the Napiers of Merchiston Castle, who settled in Dorset. He was educated at Exeter College, Oxford, Fellow 1559, Bachelor of Arts 1562. He entered the Middle Temple in 1566, and was fined for failing to act as reader in 1588. In 1593 he was knighted and sent to Ireland as Chief Baron of the Irish Exchequer. As a judge Napier was universally agreed to be a failure. While some (though by no means all) other English judges found the damp Irish climate a burden, most of them made the effort to perform their duties conscientiously enough. Napier on the other hand sent back to England a stream of complaints about his health and inadequate salary. He lobbied for a Chief Justiceship in England, and crossed regularly back to England, on one occasion being nearly shipwrecked off Holyhead. In 1600 he went back to England for good and refused to return to Dublin; he was suspended from office in 1601 and replaced the following year. Napier was Sheriff of Dorset in 1606 and Chief Baron of the Exchequer in Ireland. He was a member of parliament for Dorchester (1586–7), Bridport (1601), and Wareham (1604–6). Napier founded the fortunes of the Napier family in Dorset, acquiring extensive new estates in the county including Middlemarsh Hall, which became the family seat. The Napiers also acquired an estate at Loughcrew, near Oldcastle, County Meath, which remained in the family for several generations. 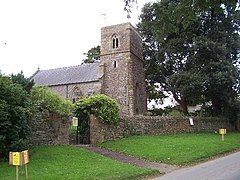 He is buried at Minterne Magna Church. In his will he left money for the accommodation of ten poor men in Dorchester: his son Nathaniel used it to build the Napier Almshouses in that town. Napier married firstly Catherine Warham, by whom he had a daughter, Anne, and secondly Magdalen Denton, the mother of his only son and heir Nathaniel. The marriage of Nathaniel to Elizabeth Gerrard in about 1599 caused a good deal of comment since even for the time the couple, at eleven and nine, were exceptionally young. Napier's son, Sir Nathaniel, was also a member of parliament, as was his grandson, Sir Gerrard, who was created a baronet in 1641. ^ a b c d e Ball 1926, p. 225. ^ Willis 1750, p. 110 (Elizabeth's sixth parliament). ^ Willis 1750, p. 148 (Elizabeth's tenth parliament). ^ Willis 1750, p. 159 (James's first parliament). ^ Brunton & Pennington 1954, p. 162. Ball, F. Elrington (1926). The Judges in Ireland 1221–1921. London: John Murray. p. 225. Barry, Judith Hudson (January 2008) . "Napier, Sir Robert (d. 1615)". Oxford Dictionary of National Biography (online ed.). Oxford University Press. doi:10.1093/ref:odnb/19765. Brunton, D; Pennington, D H (1954). Members of the Long Parliament. London: George Allen & Unwin. p. 162. Willis, Browne (1750). Notitia Parliamentaria, Part II: A Series or Lists of the Representatives in the several Parliaments held from the Reformation 1541, to the Restoration 1660 ... London. pp. onepage&q&f&#61, false 110, 148, 159. This page was last edited on 18 December 2018, at 19:46 (UTC).